How to Budget: Marketing Expenditure as % of Revenue? Just came back from a client prospect meeting. My prospect shared his marketing budget with me, in absolute dollar figures. what % of revenue should organisations allocate to marketing expenditure? Look at the organisation itself and its specific financial, market and competitive situation. Oh, and its goals! Look at benchmarks, and see what other companies do. Let’s look at both. Your marketing investment should be that % of revenue that your company needs to profitable grow the business and strengthen its competitiveness. Overall company margins. (Why margins? As marketing spending comes before the revenue will come in, it’s constrained by affordability. 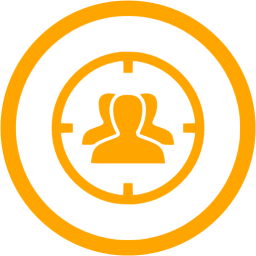 So, to set the appropriate marketing budget, it is important for organisations to work with precise sales and growth targets. I conclude that in 2019 organisations should spend about 7-12% of revenue on marketing, and up to 50% of that on digital marketing, on average. I base this on my review of a number of industry studies to analyse how much you should spend on your marketing. I started with two most reputable works, the Gartner annual CMO Spend Survey of 600 marketing leaders in N. America & the UK; and The CMO Survey, an independent research by the World Market Watch llc, sponsored by the American Marketing Association a.o. 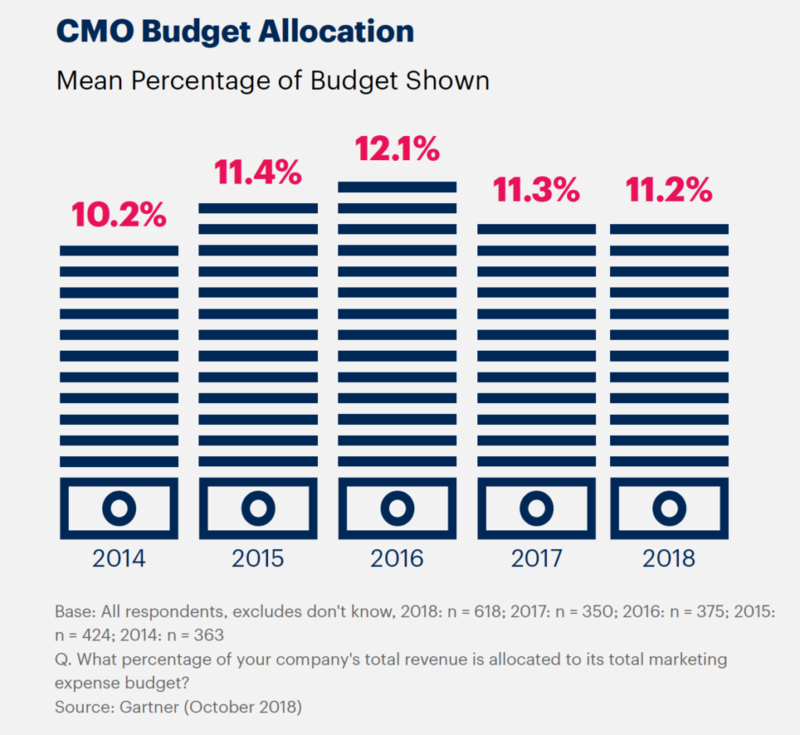 Gartner’s “CMO Spend Survey 2018-2019” survey found that year over year, Marketing budgets had remained at a steady average of 11.2% of company revenue. 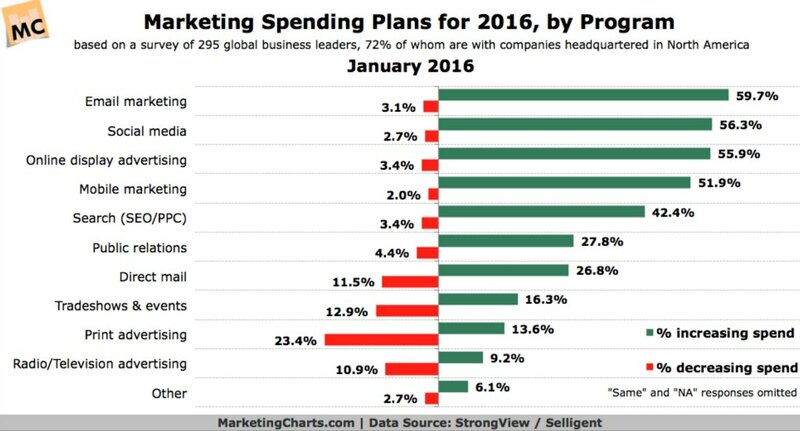 The largest companies amongst them spent the most on marketing, i.e. 11.6% of revenue. Over the years, Gartner’s study results have been approximately 3% higher than The CMO Survey. This can be partly explained by Gartner embracing all of North America and the UK, while the other study covering US only. The other explanation might be differences company size. 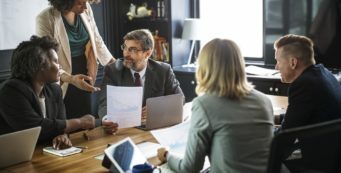 86% of the respondents in the Gartner 2018/2019 study work for organisations with $1B+ annual revenue, while in The CMO Survey from Feb 2019, it’s only 33.5% of respondents whose company is of this size. “The CMO Survey” of August 2018 indicate that companies expect to spend 54% of marketing budgets on digital within the next five years, up from 44% today. According to the Forrester’s US Digital Marketing Forecast 2014 to 2019, the average firm was expected to allocate 30% of their marketing budget to online in 2016, this rate is expected to grow to 35% by 2019. More than a third of CMOs say that digital marketing will account for 75% or more of their spending within the next five years, according to the Accenture Interactive CMO Study 2014, surveying 600 sr. marketing executives, from 11 countries and 10 industries. 54% of responding companies spent less than $1M / yr on digital marketing in 2014. At the other end of the scale, 4% of companies spent more than $100M / yr. – Accenture Interactive CMO Study 2014. To ensure the highest ROI from your marketing investment, you need a marketing plan, and you need proper analytical tools set in place to measure and optimize the success of your various campaigns, events and projects. 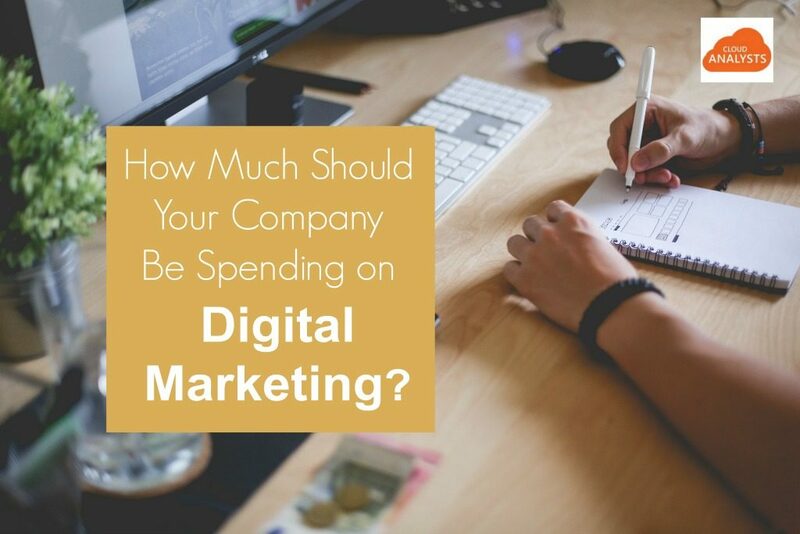 Digital marketeers have it easier than their brand marketing counterparts as they can quantify and proof the ROI of every marketing dollar spent. Unlike sales, marketing ROI isn’t imminent and immediate – not always- so a reasonable timeframe (on average a year) must be applied. Digital marketing analytics tools like TrenDemon can help digital marketeers determine and enhance the ROI of their content marketing, social media marketing and marketing automation. Great. While all these figures are nice averages and possibly useful indications, companies should not underestimate the importance of their company goals when setting their sales and marketing budgets. Yes, even B2B companies can be ‘marketing’ or ‘brand building’ companies. Take Salesforce for example. Here’s one of the fastest growing companies in the world. They spend about 50% of revenue on sales and an additional 25% on marketing. The rest is product development, engineering, management, etc. It takes little brainpower to deduct that their dedication to sales and marketing is what keeping this company’s on its track of massive growth year-over-year. Like to discuss what % of revenue would be reasonable? Contact us.